A delicious, tasty goat's milk drink with no goaty taste. Great for those who are lactose-intolerance. Packed with protein, enzymes and vitamin A thats important for general health wellbeing. Helps to prevent cancer, treat gastric, stomach ulcer, jaundice, asthma, insomnia, skin problem, hepatitis A, migraine, and kidney problems. Strengthen lungs immunization system, contains anti-arthritis factor (joint inflammation). Balance Blood sugar level, increase alertness and concentration. 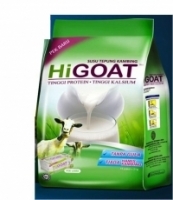 Goat milk is rich in various nutrients, and is the natural dairy closest to human mil It also contains natural relaxants such as niacine (vitamin B3). Helps prevent cancer and treats gastric problems, stomach ulcer, jaundice, asthma, insomnia, skin problems, hepatitis A, migraine and kidney problems. Goat milk provides optimal pre-and post-natal nutrition and pregnant women are encouraged to drink goat milk to promote healthy fetation. It help preventive and treatment forcancer, gastric, stomach ulcers, jaundice, asthma, insomnia, skin diseases, hepatitis A, migraine, kidney failure, hypertension,heart attack, diabetes, tuberculosis , gout and arthritis. 1. Goats milk is less allergenic. The allergic reaction caused by a protein allergen known as Alpha s1 Casein found in high levels in cows milk. The levels of Alpha s1 Casein in goats milk are about 89% less than cows milk providing a far less allergenic food.In the United State the most common food allergy for children under three is cows milk. It can caused vomiting, diarrhea, and skin rashes and severe effects can be as serious as anaphylactic shock!In fact a recent study of infants allergic to cows milk found that nearly 93% could drink goats milk with virtually no side effects! Goats milk is better for human consumption. A baby usually starts life at around 7-9 pounds, a baby goat (kid) usually starts life at around 7-9 pounds, and a baby cow (calf) usually starts life at around 100 pounds. Now speaking from a purely thermodynamic position, these two animals have very significant and different nutritional needs for both maintenance and growth requirements. Cows milk is designed to take a 100 pound calf and transform it into a 1200 pound cow. Goats milk and human milk were both designed and created for transforming a 7-9 pound baby/kid into an average adult/goat of anywhere between 100-200 pounds. This significant discrepancy, along with many others, is manifesting on a national level as obesity rates sky rocket in the U.S.